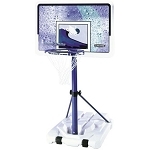 Lifetimes 54 inch Acrylic Backboard features a pro-glass look and provides superior performance. 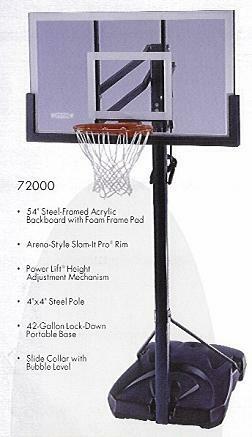 The steel frame gives added rigidity for improved rebound. The graphics are screen printed with ultraviolet protected inks offering fade resistant color. 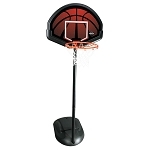 Play like the pros with the high-performance Slam-It Pro Rim. 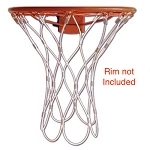 This rim features an arena style wraparound brace, supporting a 5/8 inch ring of solid steel. Welded steel net hook do not require replacement. Double compression springs provide excellent springback action. Built for aggressive play. Lifetimes 4 inch square pole is excellent for strong and solid goal support. This pole is protected with a weather resistant coating. - Pole Size: 4" x 4"
Dimensions: 55" x 42" x 13"